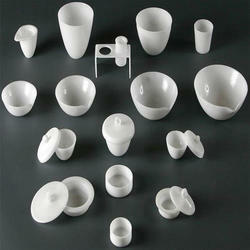 Our range of products include nickle ware crucible. With a rich industry experience, we are engaged in sourcing and supplying of a superior quality range of Crucible - Lids - Basins - Nickle Ware. Also, we make avail these Porcelain Basin with Spout "Anchor" China make products in varied capacity of 35ml 50ml 75ml 100ml 115ml 125ml 140ml 150ml 200ml 300ml. Apart from these, bigger sizes are also available. Looking for Crucible - Lids - Basins - Nickle Ware ?